"I was in my room with another priest at 8.15 when suddenly we saw a blinding light, like a flash of magnesium. As I opened the door which faced the city, we heard a formidable explosion similar to the blast of a hurricane. At the same time doors, windows and walls fell upon us in smithereens. "We climbed a hill to get a better view. From there we could see a ruined city: before us was a decimated Hiroshima. Since it was at a time when the first meal was being prepared in all the kitchens, the flames contacting the electric current turned the entire city into one enormous lake of fire within two and a half hours. "I shall never forget my first sight of what was the result of the atomic bomb: a group of young women, eighteen or twenty years old, clinging to one another as they dragged themselves along the road. "We continued looking for some way of entering the city, but it was impossible. We did the only thing that could be done in the presence of such mass slaughter: we fell on our knees and prayed for guidance, as we were destitute of all human help. "The explosion took place on 6 August. The following day, 7 August, at five o’clock in the morning, before beginning to take care of the wounded and bury the dead, I celebrated Mass in the house. In these very moments one feels closer to God, one feels more deeply the value of God’s aid. Actually the surroundings did not foster devotion for the celebration of the Mass. The chapel, half destroyed, was overflowing with the wounded, who were lying on the floor very near to one another, suffering terribly, twisted with pain." Fr Arrupe’s view of the bombing of Hiroshima was from the inside. He was inside the house when it happened, tried to find out what happened, and then became preoccupied with tending to the injured. He was a doctor. He does not reflect on the morality of the bombing. A view from outside illustrates better the barbarity of what was inflicted on Hiroshima. It was apparently a lovely sunny day in a city that had become used to relative peace. Enemy planes regularly droned overhead unmolested but did not attack the city, so the arrival of the aircraft caused no great alarm. Then came the explosion. The elements are there: a defeated air force, a completely unprotected city visited at will by enemy aircraft, a city full of people preparing breakfast about to be made a laboratory for the effects of a new weapon. It is an image of man’s inhumanity to man. Fr Arrupe’s contribution was influential because he spoke much about the bombing and helped people to become aware of the human reality of the bombing. In his account, the bomb is clearly seen to have contributed less to military strategy than to the suffering of innocent human beings. It created a world that needed to be healed. Fr Arrupe’s account, too, discloses two forms of intellectual curiosity. One form is the curiosity of the scientists who conceived and designed the bomb to see whether and how it would work, and what its effects would be. Some subsequently struggled with their consciences. 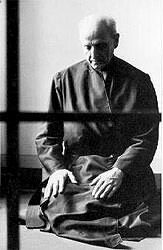 The second form is Fr Arrupe’s curiosity, that of a doctor as well as a priest — about the human effects of the bomb and how to address them. He noted the living conditions in the city, and the state of the survivors. He then turned his attention to the resources he had at hand to treat wounds and address pain, noting the importance of clean dressings. Both forms of curiosity were scientific, but Hiroshima cast a long shadow over scientific reason. It made evident the conditions of the heart under which a passion for knowledge can safely be indulged. It requires an attention to the complex and deep human reality against which the value of one’s research is tested. Since this insight always risks being dulled, the reality of Hiroshima bears remembering. We can also see in the devastated plain that had once been the centre of Hiroshima the beginnings of later environmental sensibility. It became possible to imagine realistically the capacity of humankind to devastate the world through the development of technology. For many years the threat of nuclear war, exemplified in the tests of the thermonuclear devices that could cause third-degree burns some one hundred kilometres from the centre of the explosion, preoccupied public sentiment. But it also demonstrated that even peaceful technologies could be destructive in the long term, and interested an increasing number of people in the environment. The movement has gathered force around the reality and threat of global warming. Finally, in Fr Arrupe’s description of the Mass that he celebrated after the bomb fell, we can see a tension in religious sensibility that remains with us. He describes the presence of the sick and wounded as not fostering devotion. But his hospitality to the sick and wounded places them at the centre of the mystery that he is celebrating. He leaves Christians with the question of how we bring together the different aspects of devotion: the presence of God in prayer and silence, and the presence of God in the world’s wounded. He did not solve this question, but characteristically he holds them together. The following slide show is a collection of photos taken at the Hiroshima shrine in July 2007. Andrew, thank you for alerting me to the Pedro Arrupe centenial. His "A Planet to Heal" has long been my lodestar to a profound social justice conscience. Thank youm for this article, Andrew. I was particularly struck by your explanation of Fr Arrupe's contribution to awareness raising about the human reality of the Bomb.We have just finished hosting a Japanese RSCJ sister and the College, both staff and student families have been hosting teachers and students. Having grown up during World War 11 it was encouraging for me ro see the genuine friendships being formed between young Japanese women and Australian families.